I went on a small 3 days cruise just before Christmas and I thought I better get the pictures posted before I forget all about them and they’ll just be sitting there in another folder on my computer. This was my fist cruise with Royal Caribbean Cruise Line. After two very successful cruises with Carnival I was looking forward to see if Royal Caribbean Cruise Linewould be able to deliver the same quality cruise as Carnival. Sovereign of the Seas is one of the older Royal Caribbean Cruise Line ships and it is scheduled to retire late 2008. 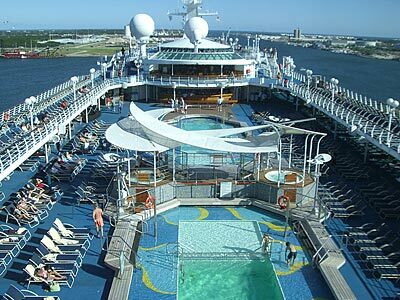 Our cruise director told us it would be moved to Spain and sail for another company under Royal Caribbean Cruise Line. 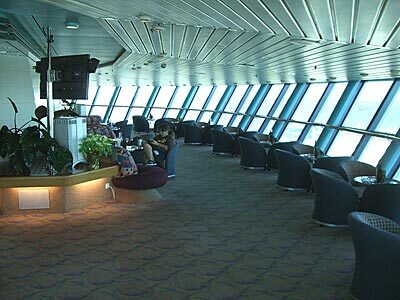 We arrived at Port Canaveral around 11.15 am and were on board 45 minutes later. I did not get the “wow effect” like I did when I first got on board in Carnivals Fantasy or Inspiration ships. The flashiness was a little bit scaled down compared to Carnivals Fantasy class ships. Don’t get me wrong. 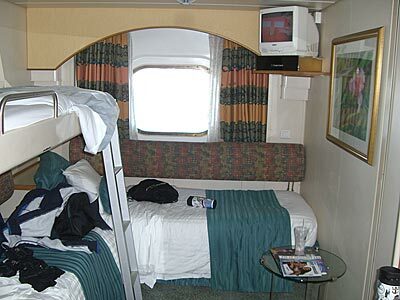 I definitely liked Sovereign of the Seas and what it lacked in look, it had in lounge areas. 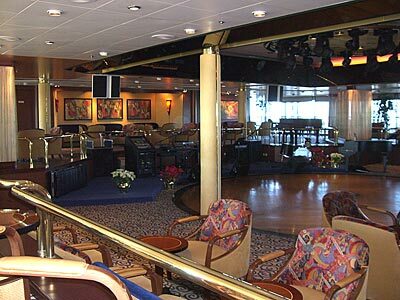 There were so many nice places to hang out and even though the ship was full it never seemed crowded anywhere. We stayed in the pool area and enjoyed the wonderful buffet until our cabin was ready around 1 pm. The cabin was ok. It was very small and I’m pretty sure the cabins in Carnivals Fantasy ships are at least 50% larger. It was clean and functional though. There was plenty of closet space and after unpacking the suitcases could be stored under the bed. 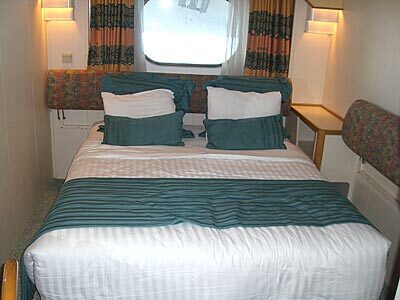 In our group we had one cabin with a queen bed and another cabin with three beds where one of them was a pull down bed. 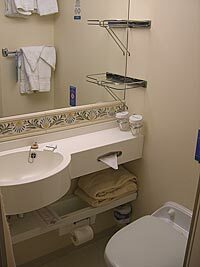 The bathrooms were also small, but that was expected. Our two rooms were connected with a door between them. Around 4 pm we had to go through the usual muster drill. 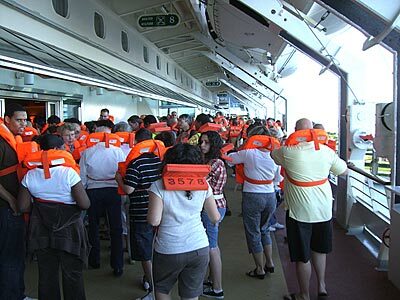 What a pain it always is, but it is required by law that all cruise passengers go through it before the ship is leaving port. We always got our dinner in the main dining room. The food was really good, but we all agreed that it was a little better when we were with Carnival. When we were cruising with Carnival we were also able to request items not listed on the menu, but on Sovereign of the Seas, when one from my group asked for a piece of cheesecake he was told he could only get what was on the menu. It’s no big deal really, but it is just one of the small differences we noticed. 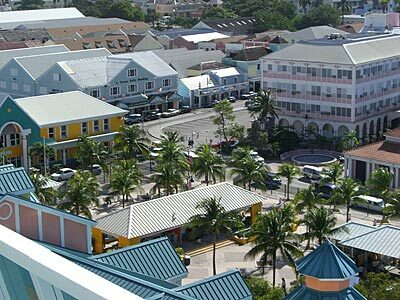 Our first stop was in Nassau, Bahamas. I’ve been there a couple of times before and pretty much have seen what there is to see. We went to the straw market and bought some knockoff designer purses, wallets and sunglasses and walked around in the city. The next day our stop was at Coco Cay Island. 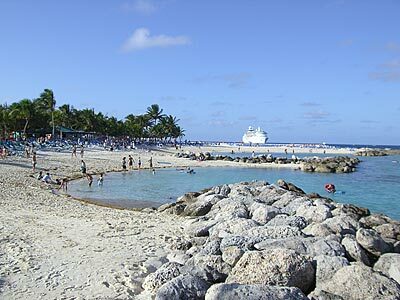 Coco Cay is Royal Caribean’s own island and we had a great time there. They have a nice lunch buffet lined up when you arrive and there are plenty of lawn chairs along the beach. We started doing a little shopping in some of the souvenir shops there, went for lunch and after that just hung out on the beach. All in all we had a really good cruise and I really need to go cruising on one of Royal Caribbean’s larger cruise ships before I can do a real comparison to Carnival Cruise line’s cruises. Caribbean’s larger cruise ships before I can do a real comparison to Carnival Cruise line’s cruises. ← The best laptop ever – Period!